All children deserve the right to education and with the Individuals with Disabilities Education Act (IDEA), that became law in 1975. This law was passed to offer children with disabilities a “free, appropriate public education” (US Gov., 2016). This law enables schools to offer special education whenever necessary for children who need extra support or any special needs to participate in the public education they deserve. This can be assistive technologies, accommodations for their disability, teachers with special qualifications, or modifications to the school, classroom, or other spaces or materials necessary for success in education (US Gov., 2016). Helping students succeed requires identifying students in need. According to IDEA there are fourteen categories recognized for needing help under the law. Click the button below for a map of disabilities, accommodation ideas, assistive technology ideas, and case studies. Early intervention is the best way to help students succeed, so teachers are on the lookout for students that show signs of a learning disability that parents or doctors have not diagnosed or noticed. If a student needs help they then go through the referral process. How do we know who deserves the extra support and who does not? This would be the referral process. Each student that is suspected of having a disability (or is struggling enough) must receive a fair assessment to determine if they qualify for special services, according to the law. The first step in the process is recognition where the teacher, with parental involvement, assesses any issues and tries to figure out if there is an action they can take to solve the problems. The second step is pre-referral where chosen accommodations worked on by the teacher(s), parents or guardians, administrator, nurse, or any other person involved in the education of the student are implemented. The third step is referral for special education evaluation where the accommodations have not worked effectively and the paperwork for official evaluation is done with parents' consent. The fourth step is the special education evaluation where the student is evaluated by a team of experts from the district to decide if the student qualifies for special education services. The fifth step is eligibility where it is determined whether or not the student has a disability on the list of 14 covered by IDEA and that special services are needed to provide the student with appropriate education. The sixth step is the IEP meeting where the school district and the parents enter into a legal contract on what will be provided for the student's needs in learning and what actions the school will take to make sure the student is being offered the appropriate education required by law. The seventh step is IEP implementation. The final step in the process is revaluation where they decide how well the IEP interventions have worked and if they need to alter them in any way. Calling it the final step is a bit of a misnomer because that just means we circle back to the IEP, but it is the last step on the list before repeating steps. If it is determined the student no longer needs special services, then it would be the final step. If they still need services, then the IEP is updated for any changes to needs every year. For the full referral process, click the button below (Project IDEAL, 2013). I was lucky enough to have a friend whose husband is a special education teacher that was able to help me out with an interview. Mr. Stugelmeyer works in the Franklin Pierce District in Washington state. I asked him about the process of referring a student for special education and he made it clear that everyone can be involved. "Anyone who has contact with the student" can refer the student. (Stugelmeyer, 2016). He goes on to say that if the student is a new referral, then the school psychologist will lead the process, but if they are already receiving services in another area then they would have a case manager that would take the lead but it would be when the next IEP meeting was scheduled and they would reevaluate the student's situation. I asked about what signs a teacher might look for to identify and he offered a few options based on the category of struggle; for example, if the student is falling below the fifty percentile of the same-age general education peers it would be something to pay attention to down to the 10 percentile would be a "significantly impacted range" (Stugelmeyer, 2016). He mentioned that behaviorally, it might be harder to tell, but that making sure there is strong classroom management, positive teacher interaction, and using data to target behaviour problems a teacher might weed out learning disabilities as the solution. If they continue to have behavioral problems after offering solutions and collecting lots of data, then the IEP team can have the best chance of making good decisions on the next step. I also asked about teacher training in the subject of special education and he mentioned that there is a lot of training offered by the district, city, and state and it has been very helpful to stay informed. I had the pleasure of interviewing Mrs. Anderson from Cypress Cove Elementary School in Sulphur, LA. She offered me a lot of information on the process in the St. Tammany Parish. She said that "when a student is having academic or behavioral problems and/or a parent requests assistance a student can be referred to SAT" (Anderson, 2016). SAT is the Student Assistance Team which is made up of the referring teacher and the parent along with experts in the field from the district. The process she described follows the same process as the one laid out previously. I asked what kind of interventions are offered for students identified for special education and she said, "some are as simple as allowing extra time for assignments of preferential seating. Some students require assistive technology in order to access the academic environment, such as voice output devices or iPads. Others may require the use of icons and social stories or a behavioral intervention plan (BIP). Basically, whatever provisions that can be reasonably made for a student that enables them to access the academic environment" (Anderson, 2016). She mentioned that the parent involvement is extremely important and they involve the parents in the process as much as they can. I was curious if she was satisfied with the process and overall she thinks the process can take too long and students might be missing out in the waiting process. She cautioned over-indentifying though, so this process is necessary to make sure the students that need help are getting it. Finally, I asked about teacher training on the subject of special education and it seems that the parish offers training on the specific parts of the process, like writing out paperwork for BIP, but that there was no training offered for specific learning disabilities. However, the parish encourages teachers to continue their education on the subject. We all learn in different ways. We exist on a spectrum of learning, there are no walls separating the ‘gifted’ from the ‘normal’ or the ‘disabled’. It is a spectrum of abilities and where students fit on that spectrum can change based on the subject, situation, age, or any other number of factors. When we accept that, we can start to understand that getting “special” help is nothing special and there is nothing wrong with it. The attitude shift can help alleviate the stigma attached to being labeled “special”. Finland seems to be on this very track in their system. They believe that everyone should be able to have extra help and that being helped is the norm. The students can stay in the same class and receive extra help later, if needed (Edutopia, 2012). Recognizing the way certain students learn can help with any student, just some students might need some larger adjustments for them to participate or succeed. For example, a student that is blind would need the texts to be in braille or read out loud instead of a typical text. However, when everyone is getting extra help in some form or another, it drastically reduces the stigma attached to accepting something different than the other students. This helps the student have a better environment for learning with the added benefit of making it easier for other students to admit they are struggling with something and might need some extra assistance. Finland also makes sure they proactively look for signs of problems early when students are still able to make changes easier to new learning techniques or technology or whatever accommodations they might need for a healthy and successful learning environment (Edutopia, 2012). In tomorrow’s school, I would like to see an approach akin to Finland’s proactive, early intervention of needs for students with any issues they might be having. Also, to make sure the promotion of the idea that there is help for everyone and that there is nothing wrong with getting help. This will reduce the ignoring or over-looking of certain students instead of working harder to make sure they are successful. Every student deserves an education. Teachers around the world are spending their lives helping students with special needs. Trying hard and being patient is great, but it can still lead to problems with certain people because they have a problem we cannot tackle effectively. However, the advancement of technology (and medicine for many issues as well) has lead to breakthroughs that we never thought possible before. Deaf people are able to hear, blind people are able to see, and these limitations are no longer the limitations they once were. Adopting a pro-technology stance is to say to children that your ability to learn is the most important thing. It shows that the educators care about making sure every child succeeds, not just the ones that can succeed with the materials that we already have or are easy to obtain. It doesn’t have to be giant touchscreens, but to take into account what will help a child participate and succeed and offer them that opportunity. In New York School of One, they understand the capabilities of technology for learning. Utilizing a blended learning model where students are learning in eight different ways (five of which are live with a teacher), they are able to offer many ways to learn (SBLA, 2010). This is important because some people on the learning spectrum might struggle with one way of learning, but not with another. Someone might have trouble reading, but understands visual presentations to learn a concept. Dyslexia is a perfect example of this. If they are only using text that they struggle with, it might appear they do not understand a concept or idea, but if they are offered alternative approaches to show what they know, they can be properly assessed on the knowledge. As Einstein once said “if you judge a fish by its ability to climb a tree, it will live its whole life believing that it is stupid.” Students with learning disabilities are not stupid, they are working harder than the average student to be judged by the same standards, but if the standards were opened up to alternative assessments they might be able to shine. Technology can help teachers do that. Also, in a mastery format, all students will be able to understand something before moving on, setting them up for future success when they might have been passed up based on the arbitrary time requirement we have traditionally used for learning. A first grader might be able to read at a sixth grade level and still struggle with kindergarten math, but they should not be held back a grade because of that, for example. One common complaint would be the money issue. My first response is that, in terms of the United States, there is plenty of money if we prioritized. However, UNESCO recommends we focus on technology for assistive learning first, if there is a money issue (UNESCO, 2013). What the previous two points were leading to was that we can include all students in any class with differentiation, but we need technology to help out and we need the right attitude to implement it. I work in Korea, so I looked into the methods in which Korea deals with learning disabilities. “In 2007, the Ministry of Education instituted a program intended to integrate special needs education into mainstream education as much as possible. Central components of this program were the creation of more jobs for special needs teachers in mainstream schools and professional development for mainstream teachers to prepare them to work with students with special needs” (CIEB, 2015). They have done a good job at offering incentives for teachers to teach in schools with high rates of learning disabled students, but there has not been a lot of data showing it has been successful in reducing the achievement gap. This could be due to the program being relatively new, but it could also be attributed to an ineffective implementation, but I do not have the information to make a judgement call on that. One thing I do know, from volunteering in an orphanage with disabled children, is that society in Korea prefers to keep disabled people out of sight and out of mind. Angel House is the only orphanage of its kind and there are wonderful people there devoting their time to help teach and raise these children, but they are grossly underfunded and I have not seen the government step in for their education, even though they should be covered under the 2007 program. Special note: One thing that would strongly contribute to all three of these ideas being successful is offering teacher training that is updated and revisited often for teachers to make sure they are getting the best help they can in dealing with identification for differentiation and technological awareness for options for each student. My vision of the future school is a school where teachers are backed by society to teach all students without stigma of extra assistance. They would have access to the latest technology for mastery-based learning to better meet the diverse needs of every student on the learning spectrum. The teachers would also be able to differentiate based on the individual learning needs of each student, whether it’s a child with Down syndrome, a child that memorized their multiplication tables when they were three years old, or a child that is just struggling with a particular lesson. The benefits of diversity do not just lie in the ethnic differences or gender differences amongst students, but also the struggles and triumphs they can share together in the process of learning. Anderson, T.J. (2016, October 15). Email Interview. Stugelmeyer, S. (2016, October 18). Email interview. 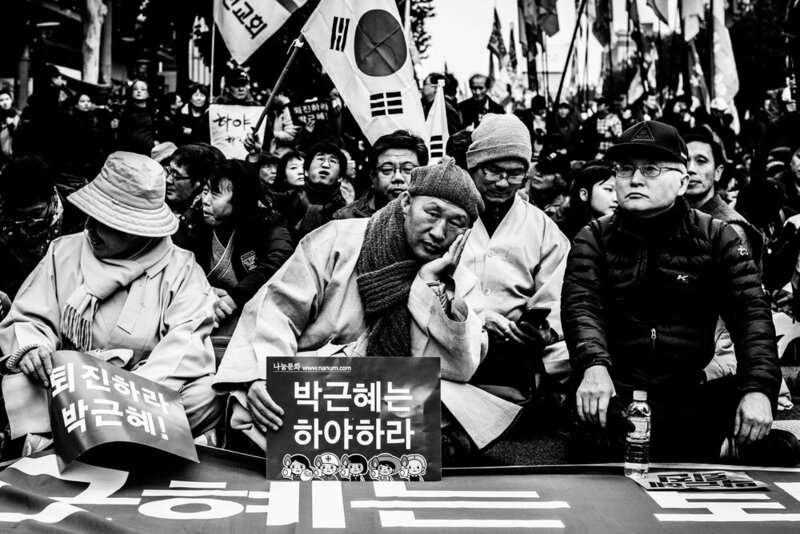 People from around 120 unions and groups organized the protests on Saturday, December 5th, that saw thousands marching through downtown Seoul. 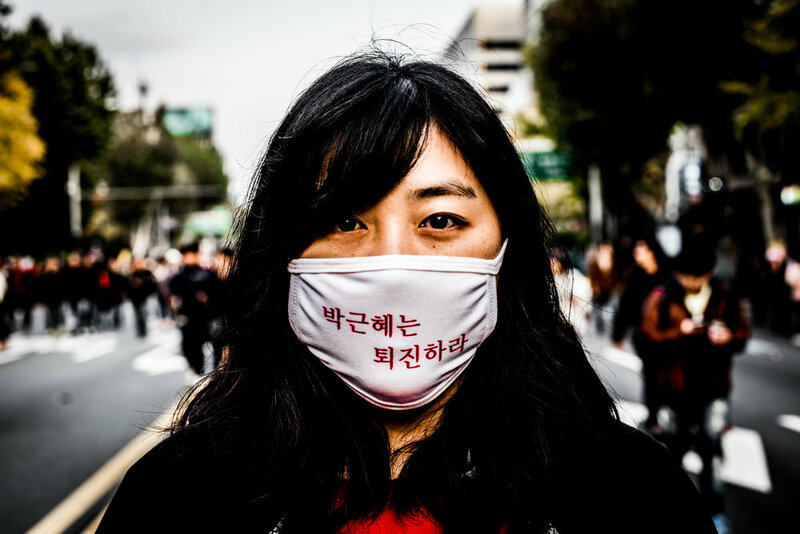 Many people carried signs that said roughly "listen to the people" as they feel the current government is not working for the people but for the Chaebol (large corporations). 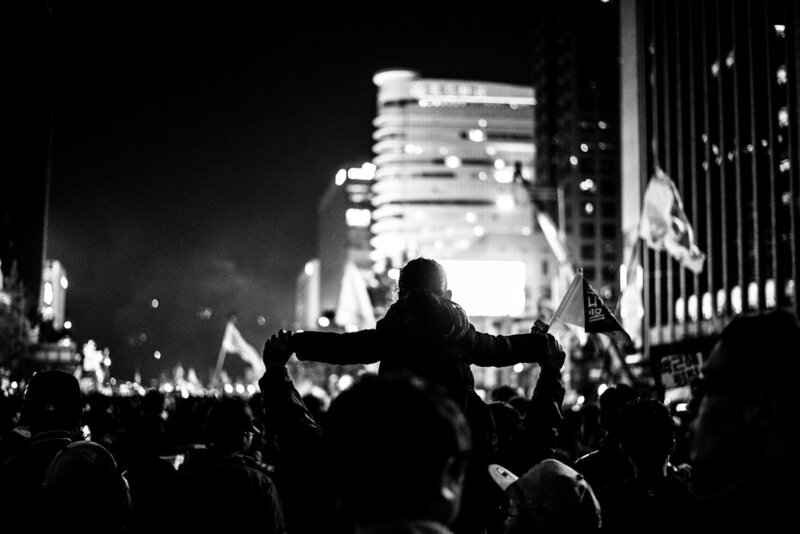 Thousands took to the streets to protest several government plans in Seoul on Saturday, December 5th. They were told not to wear masks because of the "threat of ISIS". The protesters responded by wearing thousands of masks, some dancing traditional samulnori along the way. Getting a better view of the traditional Korean dancing at the Bupyeong Festival, this girl sits on dad's shoulders. A man picks up recycling in the city while a little girl pouts in the doorway behind him. Tucked into an alley in northern Seoul, graffiti hides as people walk past. A performer prepares to entertain children on Children's Day at Children's Grand Park in Seoul. A couple gets intimate during yellow dust season in Myeongdong. "Yellow Dust" is the polluted air that drifts from the Gobi Desert, picking up coal pollution over the cities of China, to Korea. 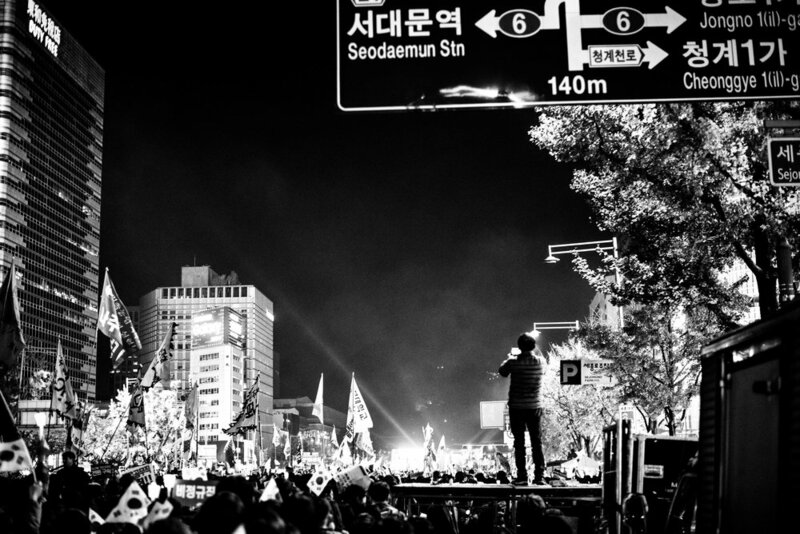 A million people took to the streets on 11/12 to protest the president in one of the largest protests in Korean history. Many religious leaders joined together to hold signs that read "Park Geun Hye resign"
One of a million protesting the president of South Korea on 11/12, holding a candle for the vigil and marching to show his support of the president stepping down. 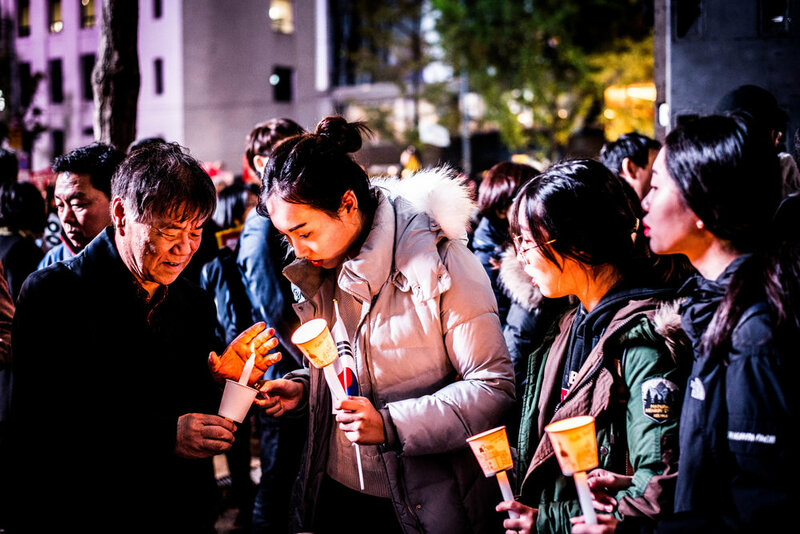 These girls help this man light his candle as night falls over approximately a million people in the streets of downtown Seoul on 11/12. 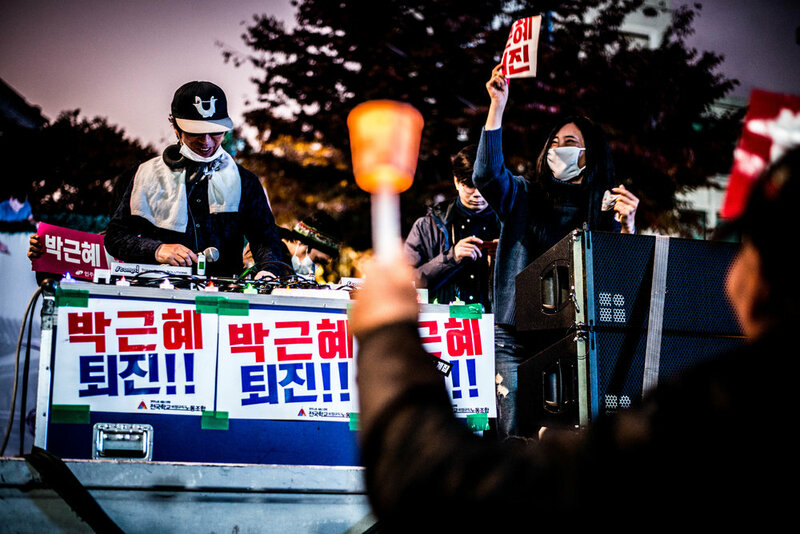 A DJ spins music for the crowd of protesters on 11/12 as they march against the president of Korea. 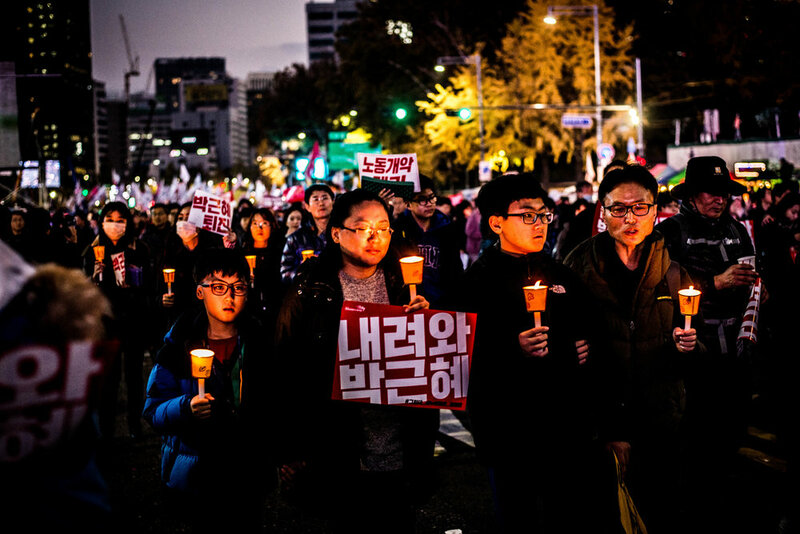 A family marches with candles during the protest on 11/12 that saw a million people spill into the streets of downtown Seoul. Overlooking the crowd in the square, a man surveys the scene. Lights, musicians, food stalls, and a million people peacefully protesting the president and chanting in waves, "Park Geun Hye resign". 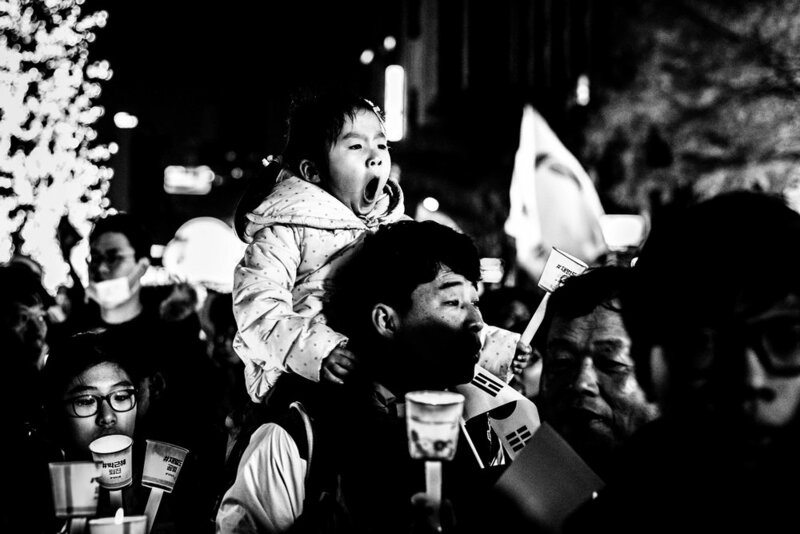 A little girl yawns on her father's shoulders late into the night as they continue to march against the president.